I don't know if I have ever mentioned on the blog my infatuation with American TV before? If I haven't I will now; I love American TV!!! Cannot get enough of it from Dexter to Pretty Little Liars to The Walking Dead I simply want to watch it all! I don't know whether it's due to the fact that every little day to day event is so overly dramatised, that there seems to be some sort of high school party every night or that everything is always so far fetched. One thing I know for sure is that there is some serious hot totty on American TV! Cor blimey! Perhaps that is apart of why I love it so much. Ha ha. It's late night on a sunday and I've had a glass of white but I thought Chic Geek Diary could do with a little eye candy! 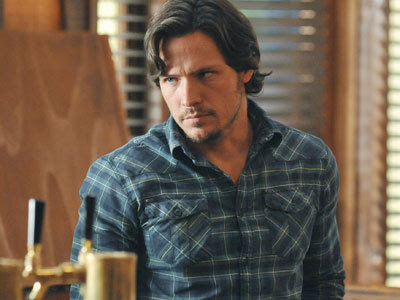 I think he is the main reason I tune in to Revenge. Do you have any TV crushes and if you do who are they? My eyes lit up when I saw him, thank you!!! I'm a American tv vampire lover with True Blood & Vampire Diaries.